I and some other beer writers were recently invited to BrewDog’s Ellon plant, where we took a tour of the ever-growing new brewery and new onsite bar DogTap, and were treated to a wonderful beer and food dinner at Musa in Aberdeen. In a conscious effort to avoid the inevitable ‘what I did on holiday’ blog post, ahead of the trip I asked various Beer People I know what they would ask BrewDog if they had the same chance as me. A lot of people feel very strongly about BrewDog, one way or another, and it seemed only fair that I extend the opportunity to others who weren’t on the trip. There were some recurring topics, and not every question made it into the interview due to time constraints, but I think there’s some fresh insight here, as well as clarification of issues that may not have been fully explained in the past. What follows is a series of questions put to James Watt on Friday 22 August, some from me, some from other people. Thanks again to James, Martin Dickie, Sarah Warman and Stewart Bowman at BrewDog for their hospitality and time. Some people are concerned about the impact you’ll have on independent bottle shops (such as Stirchley Wines in Birmingham and BeerRitz in Leeds) by opening new BottleDogs nearby. Are these new BottleDogs necessary when you already have bars with off-sales licenses in Birmingham and Leeds? Opening BottleDogs [in Glasgow, Leeds and Birmingham this year] should actually benefit the beer scenes there, increasing the availability, the appreciation and the understanding of good beer, whether that’s people opening new bottle shops or new bars. We’re all collectively against the macro, generic beers and nonsense in people’s heads about what beer can be. Our other bars and BottleDogs that we’ve opened have shown that we can actually contribute to the scene. With regard to the BrewDog Development Fund, what is your long term plan and reasoning for investing in new breweries like Brew by Numbers? There was, and remains, confusion over the equity stake you took in BBNo and CAP. What are you gaining from these investments? We’re gaining next to nothing. It’s all about helping other people get started in making beer and improving the availability of good beer. As well as cash investment, we’re helping Brew By Numbers out by giving them some old tanks we had at Fraserburgh, helping their beer get into export markets and we’re showcasing their beers at our bars. With CAP we’ve done similar things. In both arrangements it’s a minority stake. We’ve got no influence, no control and no intention to have any of those things. In both arrangements, there’s clauses written in so that they can buy stock back if they want to. We’d never want to have a controlling stake in anyone else at all. It’s just about helping other people get going. We started our business on a shoestring in 2007, and we wanted to make it easier for other people, like CAP and Brew By Numbers, to start their business. We wanted to pass on the benefits of what we’ve learned since we set up. We’ve got no other motive whatsoever, than just helping to increase the appreciation of good beer. There’s been talk of your next bar opening in Islington in London. What would you say to people who think there are already plenty of bars in London, especially given how close the proposed Islington site is to Camden and Shoreditch? Are you maintaining a focus on London, or elsewhere now? We have a focus on everywhere, so we’re continuing to look at places in London, we’re also looking at loads of places outside London, places on the edge of London. We want to open more bars. We love what our bars do. We love the enthusiasm and passion of the staff there, and we have plans to open more this year. A few people wanted to know if you would ever consider either a) brewing cask beer exclusively for the US market, where for many there it’s seen as being as ‘craft’ as it gets; or b) setting up a side concern/brand/brewery in the UK that brews just for cask for people that like it? In terms of brewing cask beer for the US: never. With cask beer it’s so much about the conditioning, it’s so much about how it’s handled. If you put that in a shipping container, it won’t show up for eight weeks. There’s no way at all that we’d brew beer that wouldn’t be in the best condition for consumers. But, given that you’ve got plans, or at least the inclination to start brewing in the US at some point, would it be something that you would consider then? Probably not. In terms of brewing for cask in the UK, I love cask and it still has its place. I think cask beer is fantastic for showcasing indigenous UK styles: milds, bitters, ESBs, which are all phenomenal on cask. They’re lower in alcohol, lighter in body, and cask dispense gives them that body. With the type of beers that we make, we think the best way to dispense those hop-forward beers is keg. We think on cask they would be too cloying and too sticky, and we feel the best way for consumers to experience beers like Punk IPA is keg dispense. 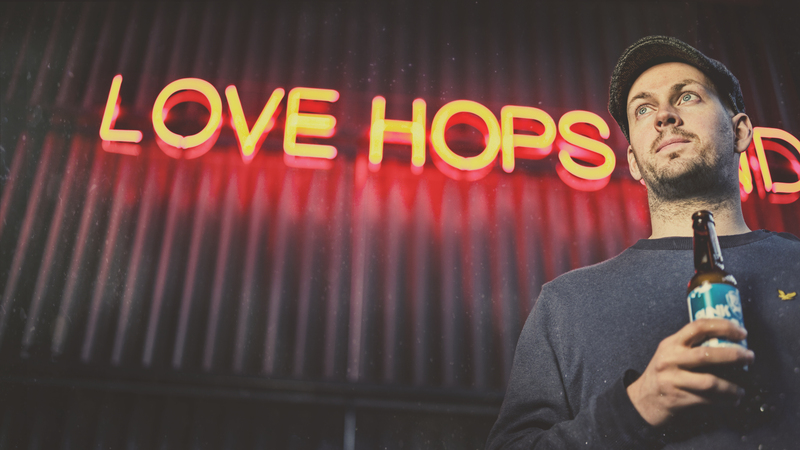 The craft beer landscape of the UK is very different now to when you started BrewDog. With self-proclaimed ‘craft beers’, including your own, finding their way into Wetherspoons, Greene King’s pub estate etc, has craft beer really become mainstream? Would you ever draw a line on where your beers are going to be sold? Well, 1 in every 2,700 beers sold in the UK is a BrewDog beer. Let’s have the conversation about craft becoming mainstream when it’s 1 in every 200 or 300. And we’ve never been elitist when it comes to where our beers are sold. We’ll happily sell our beers to Tesco, we’ll happily sell our beers to Wetherspoon. We want to help revive the UK good beer market and make people as passionate about great craft beer as we are, we want to increase the availability of great beer, and we can’t do that by being snobby about it. If they’re happy to sell our product we’re happy to sell it to them. When you’re on the inside of the craft beer industry, it’s difficult to have that perspective to see just how small it really is. When you just drink craft beer in craft beer bars, you feel like it’s everywhere, but it’s not. Some people have concerns about pricing, and want to know why you charge a premium price for your own product in your own bars. An example given was that in Shoreditch, Jackhammer is £4.90 for two thirds. At another bar nearby, an American import of similar strength is £4.50 for two thirds. Some think you are making dramatically increased margin on your own product in your own bars. Well, I’m pretty sure that the beer they’re referencing is Lagunitas IPA. Lagunitas are huge compared to us, they’ve got two production facilities, both of which are about ten times the size of this one [in Ellon]. They make phenomenal beer but in terms of our size versus Lagunitas and others in the US, we’re behind by such a long way. They can produce beer for so much cheaper than we can. Our margins are pretty tight. Making our beer is just super expensive. In one 400HL tank of Jackhammer, we’re putting in half a tonne of dry hops, which also means we’re losing 25% of the beer, so our yield is only 75%. So how much money is that, that you’re basically throwing away in order to make a hoppier beer? So a 400hl tank of Jackhammer has a total sales price of about £50,000, so 25% of that every time we brew a tank of it [£12,500], just to dry hop it as much as we want to. Plus you’ve got the cost of the hops, plus the fact you’ve added 2 weeks to the process time, so how we make our beer is just super expensive. We’re a public company, people can look at our accounts. We make a small amount of money but we don’t make a lot of money. We’ve always been about just making enough money so that we can invest in our systems, our team and our people, to make great craft beer. We’ve never taken a dividend and we have no intention to. So our pricing is what is fair so we can continue to make the beers we make. Lagunitas can make hoppy beers cheaper than anyone else, and good luck to them. But if you’re comparing us to them, you’re not comparing apples to apples because they’re so many more times the size of us that it’s not a fair comparison. On the subject of getting bigger and making beer cheaper, with many small and successful craft breweries like Beavertown and Fourpure expanding, they’ve been able to produce a higher volume of beer at a reduced cost and pass this on to the customer. Would you look to do the same thing with your own canned beers next year? No. We sell our beer at as fair a price we can. What a lot of consumers don’t understand is how the duty structure in the UK beer market works. At the moment, because we’re exporting and because we’re now at this size, we pay full duty. So we pay the same amount of duty that Heineken and Stella and Carling pay. The smaller guys that you mentioned, under this system, which is perfect for the smaller guys starting out, they pay half the duty rate we do. Which means, under that system, they can potentially sell their beers cheaper than we are. When they grow to the scale that we are, which I’m sure they will, they’ll also have that issue. For a bottle or can of Jackhammer we would pay HMRC about 50 pence, whereas those guys will be paying HMRC in the region of 25 pence. And if you consider that’s at the point of making it, once you’ve added on distribution and everything else, that’s where the pricing differs. I wish it wasn’t the case, but it’s just how the UK beer market is in terms of beer duty, so we make the margins we need to help grow the company and invest in our people, that’s all. One of the things almost everyone agrees on is that you have fantastic customer service, and some of the best-trained staff in the industry. Have you ever thought of building a business around staff training? With increasing numbers of craft beer bars, surely there’s a market for people wanting the best training in the business. Our team is perhaps the thing I’m most proud of, in terms of what we’ve done as a company. They’re passionate, evangelical, knowledgeable, a lot of them are Cicerone-qualified. Because what we do is so niche, teaching people to taste what’s different, we’re not just selling beer, we’re selling education and information. We haven’t thought about creating a business about providing that training, and it’s probably not something that we would do. We just want to focus on the personal development of our own team, being the best company to work for that we can be, and just making sure that everything goes into making the best beer. Finally, what’s your favourite soft drink? [laughs] That’s a good question. It would be a homemade thing I do myself, that’s apple juice infused with elderflower and tiny bit of chili, and a type of peas that turn into icicles, in a punch. Well, um, that’s pretty… craft. There was talk some time ago about you going into making soft drinks. What ever happened to that? It’s still something that we would like to do, and to have in our bars. We think there’s definitely a market in the UK for more artisanal soft drinks, and it’s one of th0se things that’s on a massive list of projects, things that we’d love to do, but we just don’t have the time. We’re just so busy trying to keep up with demand for what we’re doing right now. If you could make any soft drink, would you make that one that you just described, on a scale so that people could buy it anywhere? I think if we did so a soft drinks line we’d want to take advantage of the produce that we have locally in Scotland. We’ve got phenomenal soft fruits and berries locally, so we might want to do something that takes advantage of that. [EDIT 1/9/2014: Amended “Well, 1 in every 2,700 beers sold in the UK is a craft beer” to “Well, 1 in every 2,700 beers sold in the UK is a BrewDog beer”. Disclosure: Aside from being a freeloading craft wanker beer writer, I am also an Equity for Punks shareholder and was given beer, good beer too, and food and taxis and kind words and doors held open for me for absolutely free as part of the trip to BrewDog. Judge me as you will, but all these words are true. Fascinating stuff Chris. Interesting to hear that only 1 in 2700 beers sold in UK is craft. I guess when you into it you lose sight if how truly massive the market is. Do you think this varies much with your definition of craft? I suppose I don’t really have a hard and fast definition, more of a ‘you know it when you see it’ kind of approach which has served me well so far. Ultimately I don’t think a number or fractions of total beer consumption have any say on how craft the beer is – it’s all about quality, intention and artistic control. only 1 in every 2,700 beers sold in the UK is a BrewDog beer. I think something was a little lost in translation on that point. The beer may have been responsible for that! Apologies James – I’ve amended that now. Good interview. I found (as you might have guessed) the questions about cask pretty interesting. Not sure I agree an ESB is ‘lighter in body’ than dead pony club. Also, we know Punk IPA was awesome on cask, we tasted it when BrewDog first started (albeit the old version). If they were making saisons, lagers and wheat beers then maybe the argument stands up, but with BrewDog’s current line-up I think some would be great on cask. Still, they’re doing a lot of good things for British beers and their bars are, as you say, extremely well-run. Thanks for your thoughts, Neil. I totally agree that some of BrewDog’s beers were fantastic on cask – I still have quite profound flavour memories of Trashy Blonde and Alice Porter. Brixton Porter doesn’t hold a candle to Alice, in my opinion. And yes, ESBs aren’t light-bodied beers, but for me it is a beer style that is absolutely best suited to cask. I think the only decent keg ESB I’ve had was BrewFist’s Jale, but their head brewer did used to work for Fuller’s, so maybe that’s why it’s so good. No idea what JW is talking about here – or have they gone over to producing nothing but 7% DIPAs while I wasn’t looking? I’ve had Zeitgeist, 5 a.m. Saint, Trashy Blonde, Edge and How To Disappear Completely on cask. HTDC didn’t work at all, but the others were uniformly superb – the first two in particular were among the best beers I’ve ever had. I’ve had them on keg since; they were good, but not worth making a fuss about. Great work Chris, proper journalism. The other beer wasn’t in fact Lagunitas but the same principle can be applied.